This made me smile because I expected it to turn out horrible. I swear my daughter has all the artistic talent. I think she got some of mine at birth. It was fun to do though. 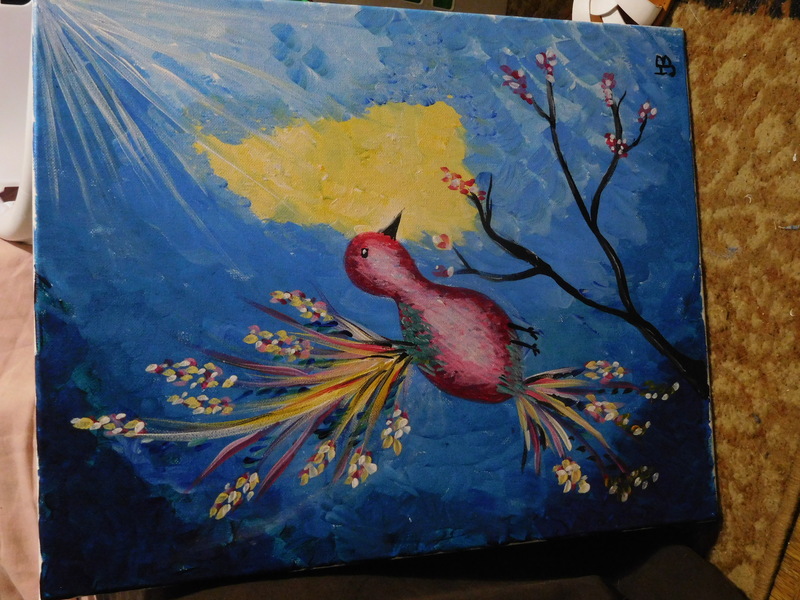 This was one of those painting party with everyone doing the same design but not one of them looked alike. Yep, we all followed the same directions but you had fat birds, skinny birds, birds with wings and tails that looked more like fins on a fish. 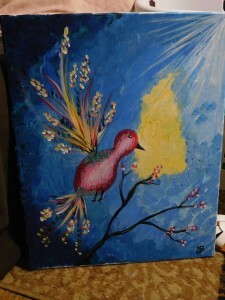 We even had one bird that was blue instead of red though it didn't stand out as well because of the bluish background. With some happy memories at the situation, the painting has become a very precious thing, hasn't it? Yes, I was pleased with it and it will always remind me of stepping out and doing something different. I did go back and soften that bit of yellow sunshine.